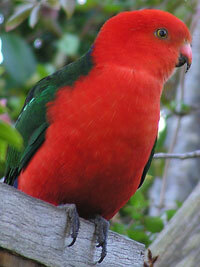 The male Australian King-Parrot is easily recognised by his red head, neck and chest. The female and the juveniles have a green head, neck and upper chest. The trouble is distinguishing the female from her immature and juvenile offsprings. 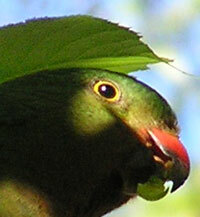 For years I had an image on this webpage that had a juvenile male labelled as a female - see image to the right. The reasons why I have now identified it as a juvenile male is its beak, iris and shoulder colour. It has the yellow iris of the male. Its beak is yellow/orange with a black tip - the female's beak is dark. The female's shoulder is green. The "female or juvenile" photo above left was taken six months earlier in the same tree. So it is possibly the same bird. I imagine it takes a couple of years for the male to sport the colours of the mature male. Here's some close-ups of the suspect. 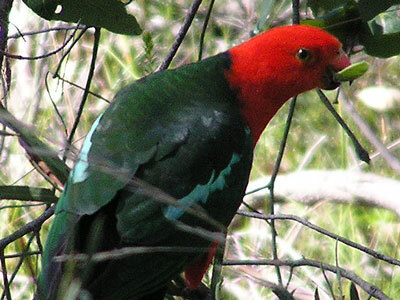 Australian King-Parrots are endemic to Australia and can be found along the Great Dividing Range and coast in Queensland, New South Wales and Victoria. 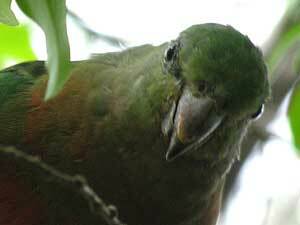 Like many parrots they are often found in pairs - sometimes with one or two juveniles who have yet to "leave home". 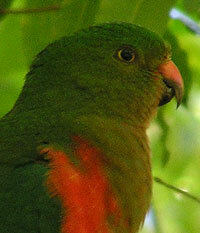 The male Australian King-Parrot has a vibrant light green "lightening bolt" on both of its shoulders. This may not be as pronounced on the female - or may be missing altogether. The male to the left is eating an acacia seed pod. These photos were taken in Cheltenham in Sydney, in the Lane Cove National Park and in Leura in the Blue Mountains.